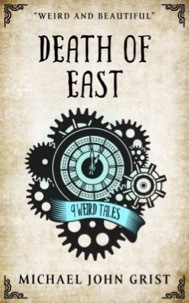 Death of East is a collection of 9 weird tales that strain against the borders of reality, filled with sky-painting giants, gods of the mud, and a world where the direction East can die. The direction East is dead. When the direction East, a giant living atop an island at the far Eastern ‘pole’, is murdered, the Empire falls into disarray. The compass can no longer be trusted, and trade with the colonies falls apart as merchant fleets founder on rocks and get lost on the open ocean. Only the Lady Arabella, a legendary explorer and captain of the fastest ship in the fleet, can help. She knew the giant East before his death, and only she suspects the true identity of his killer. But she must act with haste, as the men of the Empire seek to turn its great bureaucracy against her, even as a new and terrifying challenge rears its unlikely head – love, while she seeks to solve the question of the age. Who murdered the giant East? – “The dark insanity in this story develops out of greed and terror and self-loathing, until all healthy logic in one person is destroyed. Human life becomes as expendable as filthy Nile water. A very satisfying ending.” – Sherry Decker, Tangent Magazine. – “… a beautiful bittersweet fairy tale, set in the modern day.” – Sam Tomaino, SF Revu. – “Wow. Horrifying and compelling and poignant. This one is going to stick with me.” – Kim, Ideomancer. Hello! First, thanks for offering a book for free, that’s awesome. But…this post was published 14 hours ago and the free period expired on the 15th? D’oh!